SAM: Can you tell us what happened when you and Jodi decided to become Love & the Outcome and you hit the road? What you did in that process? CHRIS: Yeah absolutely… Jodi and I met as part of a worship collective in Winnipeg in Canada, where we’re from. And so my band was hired to be the backing band and she was already singing. So that’s how we met. So we’ve kind of – the road, being on the road and travelling is kind of in our DNA a little bit. And then I asked her to marry me and she said yes, and then we kept doing our separate things for a while but my band ended up dissolving a few years ago and then she asked me to play guitar for her. It started off sort of naturally, organically, and then we decided to make it into a band and Love & the Outcome was born. SAM: And I believe you sold everything when you hit the road? CHRIS: Yeah that’s right. We went through a two-year period of… we had sold our condo in Winnipeg. We were planning to move to LA, and start things up there and on the way down, my mom had been pretty ill for about a year-and-a-half. She had stomach cancer. And just before we kinda got to LA my dad called us and said ‘Y’know I hate to say this but I think you guys need to come home.’ And, so we did. And we got to spend two more months with her before she passed away. And it was a really special time but professionally, it was kind of like – ‘so what are we going to do now?’ We had these plans to move and we were in a bit of a limbo period. From there, we picked up the pieces a little bit but we were technically homeless. We were staying with my dad for a few months, and then the gigs started to pile back up so it didn’t really make sense to have a home base necessarily. We had some of our stuff at my dad’s place, and then go on the road and come back and then go on the road again. It took us – until we moved to Nashville last year to actually have a home address again. SAM: The big lead single from the album – He is With Us – what’s the story behind this song? CHRIS: This song, it’s kind of that three minute snapshot of what I was just talking about. He is With Us is just a statement. Sometimes I like to say there are days that are good – that you’re like, it’s easy to say that he is with us. And it’s really easy to sing this. But then, on days that are not going so well, you still have to say that. You still have to declare it because he is with us always. Some days are just better than others, so we decided we really wanted that kind of statement to be the first song that everyone will hear. SAM: You only formed as Love & the Outcome last year. That’s a pretty quick turnaround to produce an album, do you think? CHRIS: I totally agree. We were so blessed to work with people like Seth Mosley and Ben Glover, David Garcia. We ended up getting a few songs pretty quickly right off the bat and then, y’know, the whole process as far as what I’ve been able to ascertain from other people is that we have moved pretty quickly. But we have a fantastic record label with Word and everyone really believed in the songs and the project. So it just moved ahead really quickly. SAM: Where did you record this album? CHRIS: We recorded half of the songs in a mountain retreat that had a studio in Washington, and our friend Seth Mosley produced those. And the other songs we recorded in Nashville in a couple of different studios – Ben Glover’s studio and David Garcia’s studio. It was a really well-balanced way to do that. We had a very focussed time with Seth in the mountains because there is nothing else going on and then, in Nashville, there was time to let the songs simmer a little bit and we could go back and change things as we wanted to. SAM: Did it take a long time to put this together then? CHRIS: I would say the songwriting process was about a six-month process… five to six months. Then we recorded with Seth over a two or three week period and pretty much the same with Ben and David. Yeah, the recording itself was a little over a month-and-a-half. SAM: I’m keen to know what it’s like being in a band with Jodi and actually being married to Jodi. What’s that like? CHRIS: I love it. It’s fantastic… We’re just kind of built that way. It’s a funny thing to say, but like I said before, being in a band was how we started. It’s how we met. It’s how we fell in love. And the music has always been something that has kept us going. Y’know there are days where… we’re on a bus right now which is really great and kind of luxurious for us. But on the days where we’re travelling just the two of us in our Honda Element – I mean, you just need to be really good at listening to each other and recognising when y’know, I need some time by myself just to pray or watch my TV show. And there’s times when, and it’s most of the time, when it’s amazing to share this kind of a life with the person that you’re in love with. SAM: What TV shows are you into Chris? SAM: Yeah! Same with Australia, we’re into that too. CHRIS: Yeah it’s awesome. We have lots of great Aussie friends in LA and Toronto. I like to say they’re the most fun people in the world because they’re always smiling whenever I hang out with them. SAM: Ah! Lovely. [The track] City of God, I’ve read it’s been inspired by your travelling around the world, is that right? CHRIS: Yeah absolutely. We got the opportunity to travel to the Philippines and meet our sponsor child a couple of years ago. We didn’t actually realise that she was there – that she was so close to where we were gonna be and when we did, we called the World Vision office and said ‘hey, is it possible for us to actually meet, and go to her village?’ And they said ‘well, they don’t really allow that in the Philippines – for you to go to the village. But she can come to the office and meet there.’ So we actually spent like an afternoon just meeting her and her family and it was really special. She went from being the fridge magnet to actually like – she’s this person in our life! And we can talk to her and communicate with her. It was really cool. And on that trip we also got to stop in China, and on a previous trip we’d gone to Liberia and Kenya. So, I mean, the music – God has allowed the music to take us around the world and we’re really grateful for that. It’s kind of inspired that song, that it doesn’t really matter where you’re from, what you look like, what you smell like – we are all part of the city of God. SAM: As this album does spread around the world as people are listening to it, how do you make sure that all the glory goes to Jesus? CHRIS: That is a really good question. It’s the kind of thing where you’re on stage and you’ve kind of watching bands like U2 and Bruce Springsteen and Amy Grant – that you want to put on a really good show. You don’t wanna just be up there kind of just rehashing the songs as people hear them on the album. I mean, that’s good too – but you want to be entertaining. You want to show people that you can have a good time too. So, for us – we always have a moment at least a couple of times in our show where everything just gets a little more quiet. A little more serene. And Jodi and I are singing to each other and – we kinda joke that God made us really good at showing off but, it all goes to him. All the glory and praise goes to God, every night. That’s the only way we can do it. We both tried in previous incarnations of our musical lives, to write songs that weren’t necessarily glorifying him in a direct way – and it took us to come together and put together an album like this for things to really hit home. SAM: There’s a few different music stylings on this album – I can feel some Nashville influences, but there’s also some pop influences. What influences did you guys have as you went about writing this album? CHRIS: Yeah. Like a said before I grew up with U2 – they were kinda my favourite band and Jodi, she loves Sheryl Crow and Amy Grant. So some of those classic influences, but we’ve been listening to a lot of stuff. Everything from The White Stripes […] to Feist and we kind of joke that I’m the rock and Jodi’s the pop – so I kind of get to mess around with really fun guitar tones and she just has these great melodies in her head. We put those together and that’s what comes out. SAM: The track The Story You’re Building in Me, it seems like a very personal song for you. What can we listen out for as we hear it? CHRIS: Yeah, for sure. If He is With Us is the more universal theme of the album, then Story You’re Building… is the personal one for both of us. We had sat down to write with Ed Cash in Nashville and we were both a little nervous because he’s a great songwriter. He’s written great songs for people like Chris Tomlin. We’re like ‘Can we do this?’ and he was so welcoming and so gracious. We sat down and he just turned on his iPhone and said ‘let’s just tell your story.’ And this is what came out. The same day we sat down to write with him, Jodi’s parents were selling the home that Jodi had grown up in. And Ed was going through a similar thing, he said ‘we’re going to uproot our family and move to a different place and it’s kinda tough.’ So we kind of struck a chord immediately and ended up putting the story about my mom in that song too and how she is watching over us. It was a really special time. SAM: Your band name Love & the Outcome, what does that mean? CHRIS: We had gone through a few different names that we realised were not going to work because they were either taken or another website had that kind of a name. But we knew we wanted to start with ‘love’ because we’re in love, and I believe that’s where God had started with us. Everything exists because God loves us. We’re kind of thinking that – I see God’s love as something that’s in motion. Like, it never changes in essence but it’s always kind of moving things forward and propelling the world forward. And, how can we creatively capture that in our name? We just came up with Love & the Outcome. One cool thing is that people will come up to us at our table and say ‘this is what I think the name means’. I think that’s really cool too. It started off – we’re in love – and our music is the outcome. Or, God loves us and we are the outcome of his love. Those are both really Biblical themes, but it’s really interesting that people are coming up with their own ideas too. SAM: I’ve just seen the video for He is With Us, it looked like it was a lot of fun to make? CHRIS: Absolutely. Our manager is based in Toronto and he has a guy that we’ve used before to make videos when Jodi was a solo artist. So he knew us pretty well, knew our heartbeat. And we ended up recording the whole thing in a studio in one day. We played the song about 50 times from all different camera angles. And then Phil added all the lyrics afterwards. And because of the starkness of the white on black, it just became really cool. The look seemed a little more unique that some of the other lyric videos that we had seen. And we’re starting to use it in our live show too and it’s really connected with people. SAM: I was wondering about the handwriting in paint – whether that was yours or Jodi’s font? CHRIS: I wish that I could admit that it is, but it’s actually something that we came up with with a friend of ours in Nashville and we used that same font to paint the wall that is in all our photography. And Phil was able to capture that for the video. So it’s really cool. It’s nice to have something that’s consistent across all of our stuff. SAM: Yeah, it made me want to get back into finger painting. SAM: Is there a big idea or a key message to this record as a whole? CHRIS: That’s a really good question. I really feel like we have been put together to do this because this is our best stuff for the kingdom. We are musicians and we’ve tried to do other things, and we probably could have pursued other things, but this is where our heart is. It’s our best way to grow the kingdom of God, through our music. And I think songs like He is With Us and City of God really tell that message as well – be who you are but be who you are for Jesus, because he created you not to do something, he created you because he loves you and he wants to see you be who you are. SAM: The track Bring Us Back has a real 80s pop influence on it, what can you tell us about it? CHRIS: Well yeah, I think that’s my Sting song. We’d probably been listening to too much Police that day. [Laughs] It was really fun for me because it’s a really fun bass line and I love playing bass. That one touches on the marriage aspect of our career too. It’s not necessarily a personal story but it’s about people that we have known that have struggled in their marriage and – you hear that cry whenever you talk to them – ‘Lord, please bring us back together’. It’s also between people who have drifted away from God too. It’s a very powerful message I think. SAM: Have you heard some cool stories from people who have heard this record and been changed by it? SAM: Chris, is there any chance that you might tour this record to Australia? CHRIS: Lord willing, Sam, that would be amazing. I would so love to do that. Australia is definitely on our list of places to visit. My dad actually did a very long vacation there last year. He went all the way through – he went to the rock [Uluru]. He went from Melbourne to Darwin and back and… I don’t think we’d have time to do that, but I would love to visit Sydney and Melbourne and maybe even see the race… I get so excited about stuff like that. SAM: You mean the race, Melbourne Cup? CHRIS: No, the Formula One race. I love that kind of stuff. SAM: Ah! Yes, yes indeed. We have a lot of good races going here in Australia. CHRIS: Yeah so it’s not on the schedule yet but we’ll talk to our booking agent, maybe we can make something happen. SAM: Now it seems like a lot of the album is based on God’s promises. And I guess the closing track What a Promise focusses on this. Did you intentionally pick this track to close the album? CHRIS: Yeah, that’s right on man. We knew that we wanted to close it with a really strong song. And it’s interesting in the iTunes age that sometimes those songs will get left behind because people… they just won’t get there in picking between songs. But we had an album focus with this and we knew that we just wanted that big statement at the end. And yeah, What a Promise, it’s such a big thing to say at the end of your record, that you can trust God and everything that he says he will do. Every good work that he has begun he will finish. So, we knew pretty early on that’s what we wanted to finish off the album with. SAM: Chris thanks so much for chatting… Really appreciate your time and give our regards to Jodi as well. CHRIS: I will, absolutely. It’s been so nice talking to you. And we’ll keep you in mind and I promise that if we get any inkling about Australia dates that you’ll be the first to know. CHRIS: And nice to talk to a fellow Commonwealth member. SAM: Yes! See you Chris. 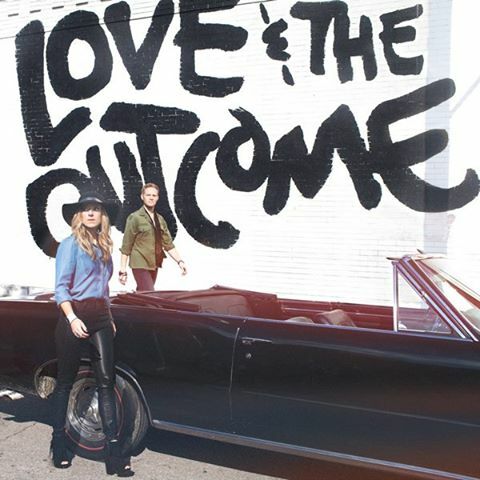 Love & the Outcome’s Love & the Outcome is available now on iTunes. Posted in MusicTagged Album, Canada, Chris Rademaker, christian, City of God, He is With Us, Interview, Jodi King, Love & the Outcome, Love and the Outcome, Music, NashvilleBookmark the permalink.